I know teacher appreciation week *JUST* ended, but this is the last week of preschool for my four year old, and so we are prepping end of year teacher gifts. If this seems like a familiar gift, that is because it is. 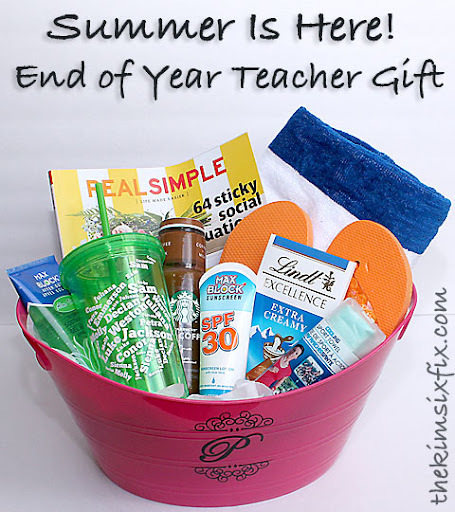 We previously put together a “School's Out for Summer” gift basket with very similar items, but this year since I have my Silhouette, I kicked it up a notch. The first thing I did was gathered up all things ’summer’ related with my budget of $20. Insulated Tumbler ($1 - Dollar Store) I personalized it with some word art made of up the children’s names. I will have a tutorial on that soon. We are definitely ready for summer!